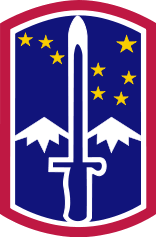 The Brigade was formed by reflagging 2nd Brigade, 1st Infantry Division on 17 March 2008. The first units began the move to Grafenwöhr in the summer of 2008. Select a unit Army in Germany 2009 170th Infantry Brigade 172nd Infantry Brigade 173rd Airborne Brigade 2nd Stryker Cav Regt.